This paper presents a biography of Antonio Millo, the sailor and cartographer. He was born in the early 16th century on the Greek island of Milos. He spent most of his life sailing in the Mediterranean. In Venice, he learned cartography skills. Between 1557 and 1591, he produced and published portolan charts, portolan atlases and isolarios. Nine of his works are known, and this paper describes three of his related isolarios, in which maps appear accompanied by descriptions of the Croatian islands. These isolarios are kept in the National Library of St Mark’s (Biblioteca Nazionale Marciana) in Venice and the National Maritime Museum in Greenwich, in London, while a facsimile edition based on Millo’s manuscript copy of his 1582 isolario is kept in the private collection of Sylvia Ioannou. A comparison of all three isolarios and the contents of maps of Croatian islands in them is given, along with descriptions. The dedication to the Marquis Sforza Pallavicino from the facsimile edition of the isolario is translated into Croatian. 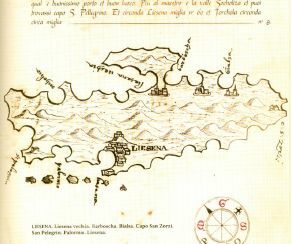 A comparative analysis established similarities and differences in the depiction of the island of Hvar on maps from all three isolarios, and the description of the island from a facsimile edition of an isolario published in 1582, for which a translation in Croatian is provided. By comparing the contents of Millo’s isolarios and those of his predecessors, and a comparative analysis of maps of the island of Hvar, Millo’s contribution to the knowledge and depiction of the Croatian islands was confirmed.